Web application would be hosted on web server 1 and web server 2. Both the web server would be configured with load balancing to distribute the load as well as fault tolerance in case of any server failure. 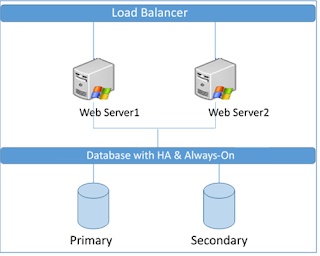 Application databases would be configured with SQL server high availability Always-On feature, it would keep database active on primary node and in case of failure, the database would be available from secondary node. Once the primary is up, database would be switched back to Primary node.